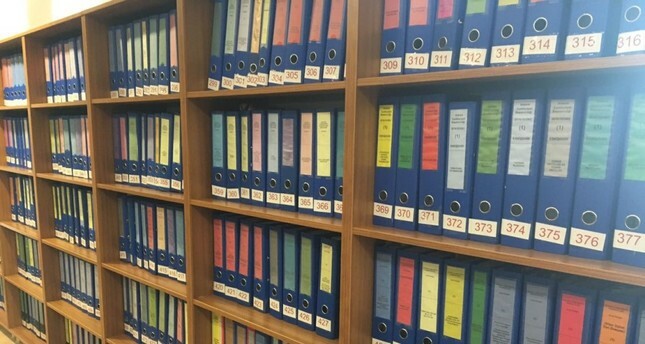 Hundreds of folders containing the indictment against FETÖ’s coup attempt on the shelves at the Chief Prosecutor’s Office. Adil Öksüz (R) is one of the main suspects in the putsch bid he supervised in Akıncı base. A trove of evidence for the Gülenist Terror Group's (FETÖ) involvement in the July 15 coup bid that killed 248 people emerged out of a 4,658-page indictment by the Chief Prosecutor's Office in the capital Ankara. The details of the indictment first released on Friday reveal ties between Adil Öksüz, a key figure of FETÖ who is accused of plotting the coup with the terrorist group's infiltrators in the Turkish Armed Forces (TSK) and seemingly unrelated "civilians" who joined the putsch bid, from a bureaucrat and his two sons serving as military officers, to Öksüz's accomplices who were "out to buy properties" near the military base where the coup plotters gathered according to their testimonies. Adil Öksüz, who remains at large after his release a few days after the coup attempt, is described by media as the "black box" of the coup attempt and investigators hope to shed more light on how the coup was planned and executed with his capture. Conspiracy theories flourished after his disappearance, however, points out that he might have been "executed" by FETÖ. The indictment says Hasan Balcı, the director of a department at a state-run history and linguistics studies center, was in touch with Adil Öksüz after the latter left detention following his initial arrest on July 16. Balcı's two sons also joined the putsch and one of them traveled hundreds of kilometers to help the putschists to take over army headquarters, prosecutors say. Hakan Çiçek, another "civilian" who was found at Akıncı military base where Adil Öksüz was captured, also had a brother serving as a military officer at Akıncı and that brother joined the pro-coup troops, the indictment adds. Hasan Balcı was arrested three months after the coup attempt which was quelled thanks to an unprecedented resistance by the public who helped anti-coup law enforcement and military officers. Balcı denied charges he was at the Akıncı base when the coup unfolded on July 15 despite the footage showing him inside the base. He couldn't explain why Adil Öksüz telephoned him three times in 10 minutes on July 17, when the coup mastermind was in detention. His younger son Halil Burak was a noncommissioned officer in the central city of Konya and flew to Istanbul on July 15 with other pro-coup troops to kidnap military commanders in Istanbul who opposed the coup attempt. Pro-coup troops had taken some commanders hostage and took them to Akıncı, where all senior military brass opposing the coup, including army chief Hulusi Akar, were held. His older son Gökhan Balcı, a major who was stationed in Tekirdağ, -a city west of Istanbul- traveled to Ankara on July 15 and was spotted helping pro-coup troops taking over army headquarters during the coup. Gökhan Balcı is seen in civilian clothes and wielding a rifle in the command floor of the army headquarters in the security camera footage of the place on July 15. He was released with judiciary control when he denied he was in the army headquarters on that date but was arrested when investigators discovered it was Gökhan Balcı in the security camera footage showing people in civilian clothes helping pro-coup officers. Hakan Çiçek, the owner of a private school linked to FETÖ, was another unusual figure found to be in a military base during any coup attempt. The indictment says Çiçek, who claimed to visit the base at night upon the invitation of a military officer, is actually a point man of the terrorist group and responsible for overseeing high-ranking military officers loyal to the cult. Çiçek's intimate ties with military officers who joined the coup is apparently covered up by his status as a school owner as the children of many officers who joined the coup attended his Anafartalar College. Çiçek's brother Maj. Gökhan Çiçek, a fighter jet pilot, was also at the Akıncı base during the coup attempt though Hakan Çiçek denied that he knew his brother was at the base while he was there. Gökhan Çiçek was arrested for joining the coup and the indictment, based on account of an eyewitness, says other relatives of the Çiçek brothers are also in the close circle of Fetullah Gülen who currently lives a life on the run in Pennsylvania. Prosecutors say in the indictment that like other pro-coup figures arrested and implicated in the coup attempt, Hakan Çiçek was a frequent traveler to the United States. He traveled to the U.S. on the same dates as Adil Öksüz, however, like other Gülenists did, they disguised themselves by traveling on separate flights or seats not close to each other, pretending they did not know each other. Another key name in the indictment is Harun Biniş, an electronics engineer who was among the "civilians" freely walking in the corridors of the command floor at the Akıncı base on the night of July 15. Biniş had claimed he was "near the base to look for a piece of land he planned to buy" when he was captured though the security camera footage showed him accompanying pro-coup officers inside the base. Biniş had denied it was him in the footage though he acknowledged he was with Kemal Batmaz, another FETÖ member captured at the military base. Batmaz is accused of coordinating the coup attempt with Adil Öksüz and remains jailed. In a related development, Adil Öksüz wil be tried in absentia for the first time today in Sakarya, a northwestern city where he worked as a theology lecturer. A court will hear testimonies of 200 defendants in a case related to coup attempt. Öksüz is charged in the Sakarya trial for coordinating the coup bid in that city as well. Fetullah Gülen, the leader of FETÖ, Öksüz and two other suspects are the only civilian defendants in the case where 196 military officers stand accused. Pro-coup troops had invaded the Sakarya Governorate during the coup attempt but they had to surrender when the police and rifle-wielding Govenor Hüseyin Avni Coş pressed on. A spacious sports hall was allocated for the trial where most of the defendants face aggravated life imprisonment for coup attempt and lesser prison terms for membership of a terrorist group. The indictment in the trial says Öksüz "acted in cooperation" with pro-coup forces in Sakarya and ordered the coup attempt. Adil Öksüz worked at Sakarya University for years and was last seen traveling to Akyazı, the hometown of his parent-in-laws, after he was released by judges and prosecutors citing lack of evidence against the unassuming academic. An investigation is underway for FETÖ's influence in his release.